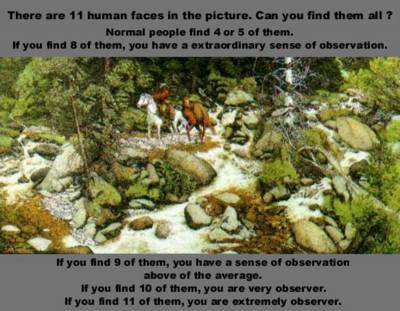 Those who saw more than 11 are borderline schizophrenics hehehe. Schizophrenia Any of a group of psychotic disorders usually characterized by withdrawal from reality, illogical patterns of thinking, delusions, and hallucinations, and accompanied in varying degrees by other emotional, behavioral, or intellectual disturbances. Schizophrenia is associated with dopamine imbalances in the brain and defects of the frontal lobe and is caused by genetic, other biological, and psychosocial factors. ok, I found 9. atleast am not psychotic. hehe! Dunno why the tagboards aren't workin'. it's been like that for 2 days already. I saw 12 faces...schizo pala ako! I didn't know that! Nakalimutan kong tumawa - bwahahahahaha! 12 talaga ang bilang ko. Baka layuan na 'ko ng mga friends ko pag nalaman nila. Hehehehe! Anyway, patitingnan ko nga 'tong pic na 'to ke hubby para malaman ko kung schizo din sya o hindi. Yehey! Ako ang nagwagi! Kasi 18 ang nakita ko! I win the one month stay at the Sanitarium! Yahoo!